Great post. I'm adding it to my list of tricks to try. I too use multiple widespread bridging networks. Thanks for posting your methods and results. 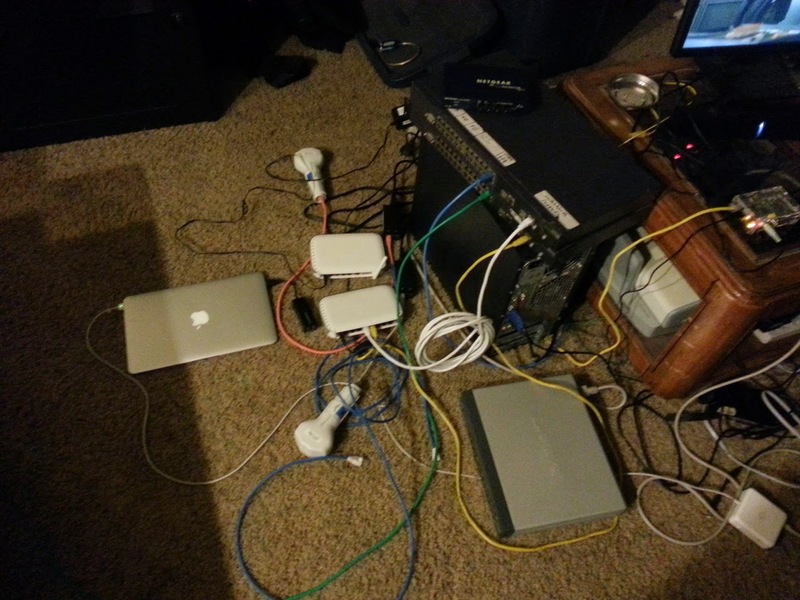 Fantastic post - sort of demystifies the entirety of successfully repeating VLAN'd packets. Physically destroyed? By big packets? By me trying to pop off a heat-sink to get a switch fabric part number and instead ripping the IC off the PCB. Probably going to post pictures in another post when I have time. I noticed the same thing years ago when I was running an ISP, but never went as far as testing the maximum size. With 1532-byte frames you could do Q-in-Q 4 deep. I suspect it is because the managed and unmanaged ethernet chips use the same logic blocks for the front-end of the MAC. p.s. it would be nice if you turned off the captcha for non-anonymous posters. I do as well. I believe many newer unmanaged switches even use the same switch fabric as managed switches, but just with a fixed zero intelligence config EEPROM. I haven't played with editing my comment system in a while, but haven't had good success lowering the barriers WRT spam in the past. I notice there are no anonymous comments, so I suspect you may already have the blogger comment settings to disallow anonymous posts. If you turn off the capcha you should get next to no spam. On my blog I allow anonymous posts, and unforutnately blogger doesn't seem to have an option for captca only for anonymous, so what I do is use the option for moderated comments after a few weeks. The crawlers spammers use don't seem to pick up new blog posts for a few weeks, so next to no spam gets through that way. I'm a little lost on what you meant. You can set a Linux computer to start managing a VLAN through a transparent switch and it will pick up the other clients on the switch and isolate them with VLAN, so they can't access each other but are on the same subnet. And the specification says this shouldn't work. Am I right here? Looking to set up a raspberry Pi to VLAN 7 other Pies on the same switch, at the same time as acting a router and load balancer/name resolver. I happen to know the SD16 and 224, and they both use chips from the same Marvell Family - and they are the same as used in the Managed versions of these switches. It does not make economic sense to build chips-for-unmanaged-switches. So, what a device will actually support depends on (1) What the chip's "factory default" setting is, and (2) What configuration changes (if any) the on-board EEPROM applies. I'd bet 99% of the time, nobody bothers changing the factory-default.